A superbly talented centreman with great balance and exceptional disposal skills, Raines originally was recruited from Swan Hill after being tied to Footscray. In his prime he was unstoppable and time and again he would burst out of the centre and send a long bomb forward. He won Richmond’s best and fairest in 1978, 1980 and 1981 and played in its 1980 premiership side. 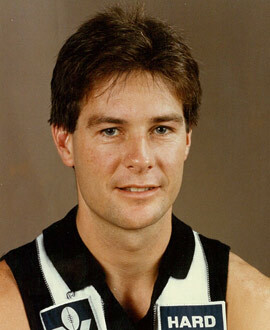 Raines was traded to Collingwood for $200,000 and three players, but he left after refusing to accept a pay cut. Kevin Sheedy had always admired Raines’ play and recruited him to Essendon but after only one year the Bombers told him he could look elsewhere. A regular Victorian representative, and an All-Australian player in 1980, Raines played exceptionally good football even in the twilight of his career, and his son, Andrew, went on to enjoy a career with Richmond and Brisbane.